Wow, since I stopped updating my Swedish blog - annesmat.blogspot.com - apparently I also forgot that I had a bunch of half-written blog posts there. Time to get working on that back log! This is a super simple little sauce or dip. I can strongly recommend it with lamb burgers, it's goes so well together. pickled jalapeño - the amount really varies here, depending on how hot your jalapeño is. I used a very mild variety and used three halves which didn't add a whole lot of heat. If you want more spice, add more! Mix everything in a small food processor, and mix until it's really fluffy - it'll take a few minutes. 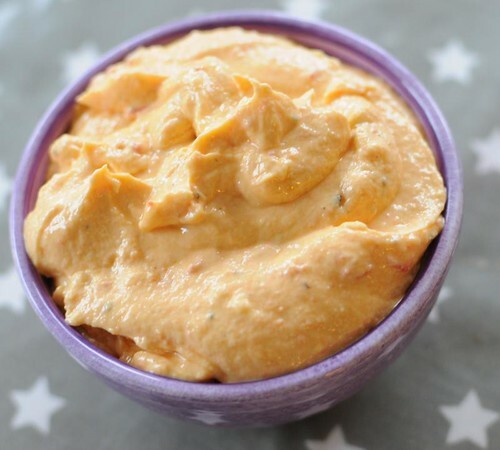 I make variations on this all the time - such a delicious and versatile dip!